New collection "The Light Within"
Hi guys! welcome to the very first post from "The SUSU Gal"! I am super excited to start this new chapter with all of you! Working with SUSU and making sustainable choices has been a journey that it's not always easy but never fails to be rewarding! and yes, you guessed it, I love handbags! and even more when they are ethically made. But, if you had to choose one, which one to go with? In a perfect world, with unlimited resources, time in our hands and closet space, we wouldn't have to choose... just get a bag for every occasion and call it a day! However, there is something fascinating about finding that gem of an accessory that can be used and used again, without losing its charm, perfect for (almost) every occasion, confortable, functional, affordable and made with high ethical standards, to add a hitch to your step every time you think about how much safer the environment is every time you use it. Ah! and don't forget, fashionable! There are literally dozens of articles online that try to narrow down the field; I have found that those that take into account all aspects of life, (almost) invariably always land you with a "practical leather tote", with lots of pockets and zero charm. Not the best choice for a night out of dinner and dancing for instance... Not to mention, questions like where did it come from? who made it? is it good for the environment? are not always answered. So, where to start? Like most of us, I love a deal in every purchase I make and when I get compliments on what I'm wearing I can't wait to tell the person how much I saved when I bought it! But when I started working closely with a community of artisans and seeing first hand how much people tend to under-pay them for their work, in spite of producing works of art under some of the most difficult conditions (no electricity, no running water, lack of access roads, desert weather...), I realized that if I were to be ethically responsible at work I would have to become so, as much as I could, in every other aspect of my life. 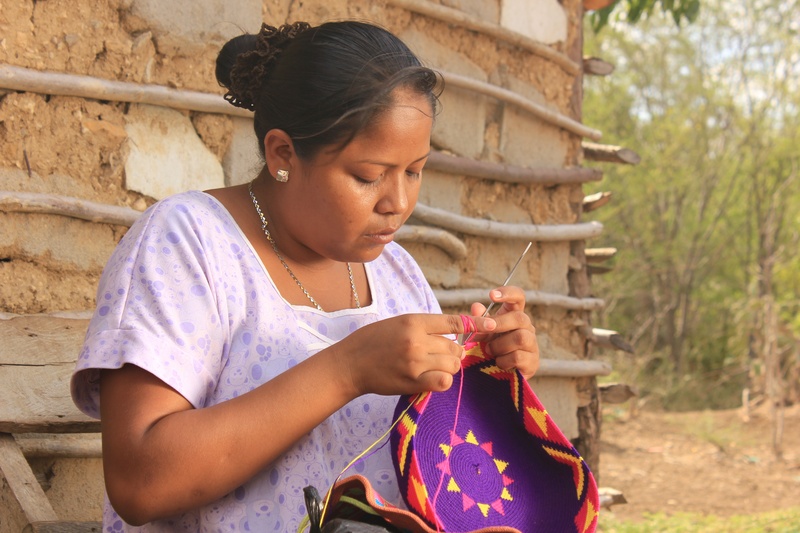 See how SUSU works with the Wayuu here. Why Fair Trade? Most of us understand the impact our choices make to our planet to some degree and want to help. The best way I have found to show people the importance of Fair Trade purchases, is by relatability: how much do 20 hours of your work are worth to you? We all value our own work, why not the work of others? 2, Even if they claim to be Fair Trade or ethically made some brands simply are not. Look for any kind of certification logo from global entities like Fair Trade International, Fair Trade Certified or even more local like Fair Trade America or even Chicago Fair Trade. These organizations take care of the guess work for you and certify businesses in their practices. I am a firmly believer in asking, so if you don't see the logo on the tag (when at the store) ask for help and extra information on the brand. If it is not available, take your search online; certified brands will always list their certification logo on their website. 3. When shopping online you can use a plugging on your phone browser like aVOID which tells you which products are associated with child labor. It works with Asos, Yoox, Amazon, Target, Macys, Zalando, Google Shooping and others. 4. There is an app for that!! Apps like Good On You gives you a rating for labor, environment and animal treatment for most major brands. You can even suggest a brand they haven't include yet, discover new ones and find shopping deals. 5. Most importantly, inform yourself; switching to Fair Trade products doesn't have to be a hassle. Most of the time a few clicks will let you know how something is being made and at the very least give you a starting point towards making a more sustainable purchase! helps you make the right choice for the world and your wallet! Copyright © 2018, SUSU Accessories. A Thread Between Worlds.